Mukti means Salvation or Nirvana and Nath mean god or Master. Mukti Holds grate significance for all spiritual people in the south Asian sub continent. Muktinath This Sanskrit name itself has religious overtone and a sort of emotional ring to it for the devout Hindus. The name is synthesis of two words - (the provider of salvation) has been one such holy site, where thousands of devotees flock for attaining the much sought after moksha (Freedom) from the cycle of birth and rebirth. It is an ardent wish or a dream if you may say, of every Hindu to get Mukti-Nirvana from this cycle taking births over and over again. It is belief of the Hindus that this world is "MAYA" (an illusion) and the earliest one gets out of it the better and a visit to Muktinath will help them achieve that goal. Since then it called Muktinath. 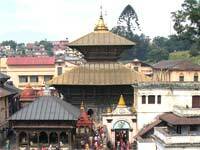 Pick up from kathmandu Airport, transfer to Hotel, Evening Visit to Pashupati Nath Temple after arati and Puja back to Hotel, and dinner at 8:00 PM , overnight. After breakfast Kathmandu city Sight Seeing place to visit Pashupatinath, Bouddha Nath,Swayambhu Nath stupa (Monkey's temple), Patan durbar squar and Krishna temple and back to hotel, Evening leisure, dinner at 8:00 PM , overnight. 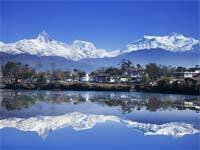 AM Breakfast, Drive to Pokhara, Arrival in Pokhara transfer to Hotel, Evening leisure, dinner at 8:00 PM , overnight. At Morning fly to Jomsom, drive to Muktinath by Jeep (1.30 hrs ) along the Kaligandaki Valley. After holy bath in Kunda,108 Dhara and have darshan /worship to Muktinath drive back to Jomsom by jeep (130 hrs. ), Evening leisure, Overnight at hotel Oms. At Morning after breakfast fly back to Pokhara, Pick up from Airport transfer to Hotel .Pokhara city Sight Seeing place to visit - Bindhabasini Temple, Seti River gorge, Gorkha Museum, Devi's waterfall, Mahadev Cave and visit the Barahi Temple by boat ride in Fewa Lake, Evening leisure, dinner at 8:00 PM , overnight. After breakfast drive or Fly back to Kathmandu, Arrival Kathmandu, transfer to Hotel,2 PM Lunch, leisure& dinner 8 PM overnight at hotel. AM breakfast, transfer to Airport for final departure.